There is nothing I like more than getting a great deal on tools. I have bought all types of tools from all types of vendors. Some have been great deals and some have been not so great. One time back in my younger (more naive) days I bought a couple thousand dollars worth of tools from a traveling tool salesman. Before the advent of Internet shopping, these guys were somewhat common along the East Coast. They would drive around, usually farm to farm, trying to sell their truck full of tools. I got suckered and bought them all. Keeping in mind that I am a carpenter; somehow he talked me into buying $2,800 worth of low quality, specialty, auto mechanics tools. At least this did inspire me to learn a lot more about how to repair my truck but needless to say, it was not the deal of the century. However, on the other side of the coin, I have found great deals on tools as well. Home Depot has a “returned and reconditioned rack” hidden somewhere in all their stores. If you are in the right place at the right time (good tools go quickly and sometimes employees have an advantage) you can get GREAT DEALS. I have bought many tools this way and received up to 50% off on top quality tools. 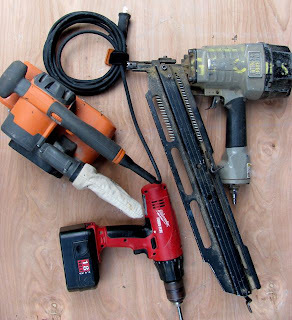 Buying used tools is another way to save a little money. Buy high-grade quality tools and purchase carefully. Pawnshops, EBay, and Craigslist are all good sources for used tools. I have had good experiences buying and selling used tools at all of them. In recent years I have joined the online revolution and have been buying most of my tools on the Web. I must admit I was very slow and reluctant to begin making such purchases but finally came around. What made me change my attitude towards shopping online was that everything is cheaper! And I didn’t have to show up at Home Depot at 5:30AM, hopeful for a possible bargain. With a little searching, you can find the absolute lowest price in the country in minutes, and 9 times out of 10 it is on Amazon.com. Because they use many smaller suppliers, all competing for your business, they can assure you of the lowest prices. If you exert some patience, shipping can be very low cost or free. Waiting a couple days for your tools to arrive is the biggest drawback but the cost savings definitely makes up for it. Consistently the lowest prices on tools with low or no shipping costs. Great deals can be found on both new and used tools. Great deals on quality tools can be found with lots of patience, persistence, and caution. Very convenient, competitive pricing, most items in stock and available, with some patience and persistence deals can be found. Very convenient, competitive pricing, most items in stock and available. stores would be this Makita cordless combo kit. Home Depot and Lowes are selling it for $233.99 and I have seen it on Amazon for as low as $198.99. This is just one example of how Amazon.com can consistently beat almost any price. So, buy quality tools and buy them cheap! I must admit, everything this guy said in his post is true. Amazon is usually ALWAYS cheapest. But watch out for shipping....... these sheisters get you that way. And Chinese tools.... DO NOT BUY THEM. GARBAGE. LEAVE THEM ALONE, or you'll just be making a trip to the dumpster.